Citation Information: J Clin Invest. 2016;126(5):1679-1690. https://doi.org/10.1172/JCI83496. Fluorescent light sheets to image cardiac morphogenesis. (A) The sample is placed at the orthogonal intersection between the illumination lens (IL) and the detection lens (DL) in the SPIM system. (B) A cylindrical lens generates a thin laser light sheet, and the illumination lens excites a thin slice of the sample in a 2D plane. The fluorescence from the illuminated planes is orthogonally detected by the detection lens. 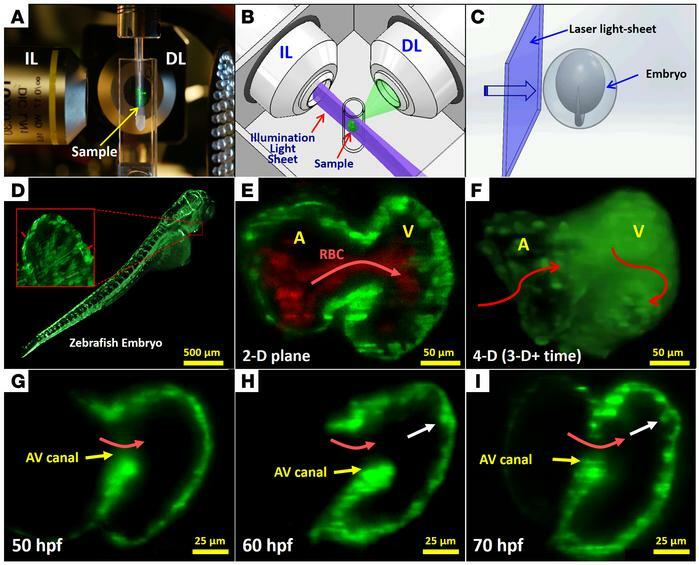 (C) A schematic diagram illustrates the laser light-sheet sectioning across a zebrafish embryo. (D) The entire embryo can be imaged within 30 seconds at a single cellular resolution. Inset reveals the trabecular endocardium. (E) Magnification of the heart reveals the contracting cmlc2-gfp–labeled myocardium and flowing DsRed-labeled red blood cells across the atriventricular valve. (F) The integration of SPIM image with 4D synchronization algorithm reveals a beating 4D heart. A, atrium; V, ventricle. (G) Trabecular ridges were absent in the myocardium at approximately 50 hpf. (H) Ridges protruding into the ventricular cavity occurred at approximately 60 hpf near the myocardial lining experienced high ventricular inflow. (I) Distinct trabecular ridges occurred at approximately 70 hpf.